The Bear Family has a new Thanksgiving adventure this year in Thanksgiving’s All Around, a Lift-the-Flap book recommend for children ages 4-8. In it, Mama, Papa, Brother, Sister, and Honey stroll through lush autumn landscapes. In search of a wild turkey after stumbling upon his tracks, the Bears find many surprises along the way. To get an insider’s look at how this book came together, check out our Q&A with author and illustrator Mike Berenstain below. Thanksgiving All Around is a Lift-the-Flap book. Could you talk a little about the mechanics of illustrating a book in this format? Lift-the-Flap books are very difficult to design—they’re like putting together an elaborate puzzle. The story has to be planned around a series of hidden surprises, these hidden elements must be logically worked into each illustration and each flap that covers the surprise must be created as a separate illustration which much line up precisely with the illustration underneath. The book takes place, of course, in November. What sort of adjustments do you make when illustrating the Bear Country landscape in autumn? Everything needs to take on a mellow autumn tonality—the greens are a warmer, yellower hue, autumn leaves must be a variety of yellows, oranges and reds. Do you make any changes to the characters to reflect the season? 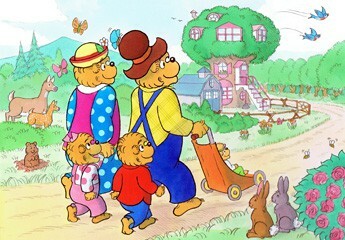 The Berenstain Bears are quite cold-tolerant—after all, they have thick fur. So, they only wear jackets and scarves when things get very chilly. In addition to Bears, Thanksgiving All Around features all sorts of animals, like a woodchuck, kittens, turkeys, and more. How did you decide which animals to include? The decisions about which ones to include was based on what would work with the flap book format. For instance, the idea of making a cloud in the sky into a flap suggested having a flock of geese flying by underneath. Thanksgiving All Around was published by HarperCollins on August 26th.